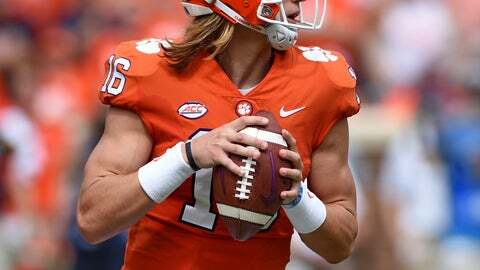 Trevor Lawrence has yet to play a full game for No. 4 Clemson. The Tigers hope the only reason their freshman quarterback won’t finish this one is because it’s another blowout of Wake Forest. Lawrence is expected to make his second start Saturday when Clemson (5-0, 2-0 Atlantic Coast Conference) visits the Demon Deacons (3-2, 0-1). So are the Tigers, who are favored by 17 points and have won nine straight in the Atlantic Division series with the last six of those coming by at least two touchdowns. And the main subplot surrounding them has been Lawrence, who was so impressive early in the season that he claimed incumbent starter Kelly Bryant’s job for last week’s game against Syracuse, resulting in Bryant announcing plans to transfer . Lawrence then sprained his neck while taking a hard hit shortly before halftime against the Orange, and the Tigers ultimately needed former third-stringer Chase Brice to lead the comeback that saved them from defeat. The Demon Deacons also start a freshman at quarterback, but they haven’t dealt with nearly as much drama. Sam Hartman hasn’t often looked like a freshman, ranking third in the ACC in both total offense (278.6 ypg) and yards passing (237). Their issues have come on the other side of the ball: Wake Forest has the league’s worst total defense, allowing 461.2 total yards, and were so humiliated in their last matchup with a top-10 team — a 56-27 home loss two weeks ago to No. 6 Notre Dame — that coach Dave Clawson fired his defensive coordinator the next day. They showed improvement in last week’s 56-24 win over Rice. Wake Forest probably will need some big plays from receiver Greg Dortch to pull the upset. Dortch, the subject of double teams all season, is coming off his best game of the year — an 11-catch, 163-yard performance in which he matched his own school record with four touchdowns in a bounce-back victory over Rice. Clemson defensive tackle Christian Wilkins was shocked at Brice’s crucial fourth-quarter, 17-yard run to the Syracuse 15 — both for its success on the Tigers’ winning final drive against Syracuse and for how long it took. The first-round NFL prospect didn’t hold back on Brice’s speed, saying “Chase is probably the slowest quarterback that’s ever been at Clemson in my time. But it was definitely fun to see. He just showed that competitiveness and will to win.” Four plays later, Travis Etienne scored the game-winning TD from 2 yards out. Wake Forest’s last victory in the series came 10 years ago — and it turned out to be a turning point for the Clemson program, because in the aftermath of that loss came the ouster of coach Terry Bowden. The Tigers tapped a relatively unknown assistant — Swinney — to take over the program and haven’t looked back. Bryant may no longer be on Clemson’s roster, but the one-time senior starter still holds a strong place among his teammates. Brice said he got a text right after the Syracuse win from Bryant and a hug from him a short time later when they ran into each other. “We keep in touch,” Brice said. Receiver Hunter Renfrow said Bryant deserves his teammates’ respect and for them to stand behind him. Bryant was 16-2 in two seasons as Clemson’s starter.